Video Games, Movies, TV and everything Pop-Culture. Sion Sono has had a rather interesting career. The former member of a religious cult turned leader of the performance art collective Tokyo Gagaga, and later director of gay pornographic films as well as “pink films,” reached a wide international audience and established himself as a cult director in 2001 with Suicide Club. Ever since the avant-garde poet has been on a role, releasing hit after hit including cult favorites Hair Extensions, Love Exposure, Cold Fish, Why Don’t You Play In Hell and Strange Circus (to name just a few). He’s a director usually linked to extreme-cinema with some citing him as a replacement for Takashi Miike who now sits comfortably in the mainstream. And like Miike, Sion Sono is one of the busiest filmmakers in the world, averaging about two movies a year. We’re only halfway through 2015 and he has an impressive three features (Shinjuku Swan) (Love & Peace) (Tag) out in cinemas, with three more set for release before 2016 rolls out. With Love & Peace, the director comes out of his comfort zone to deliver a startlingly touching and accessible film that the whole family can enjoy. Based on a screenplay he wrote two decades ago, Sion Sono gives the rock movie a makeover by fusing together slapstick – romance – politics – classic Hollywood Christmas movies – Tokusatsu films, puppetry, and stop-motion animation. A bizarre thing, this crazy movie is every movie you loved as a kid crammed into 117 minutes of cinematic lunacy. The film is set in the summer of 2015 in Tokyo, Japan. The man at the center of the story is Ryoichi, a cowardly awkward introvert who once dreamed of becoming a punk rocker but landed a lousy job as a timid desk clerk instead. He’s hated by his colleagues, has no friends, and can barely do anything right. He has feelings for Yuko, a shy co-worker who like Ryoichi also has a love for rock-n-roll. But as hard as he tries to get close to her, someone or something gets in his way. One day, he crosses paths with a turtle on the rooftop of a department store who he decides to adopt. His passion for music and living his dream, coupled with his unconditional love for his new pet is all that brings him happiness. Ryoichi finds solace at home, where he lets loose on his musical instruments, watches a lot of television and plays games with the turtle who he names Pikadon (a word that has been integrated into the Japanese vocabulary as a result of the atomic bombs). 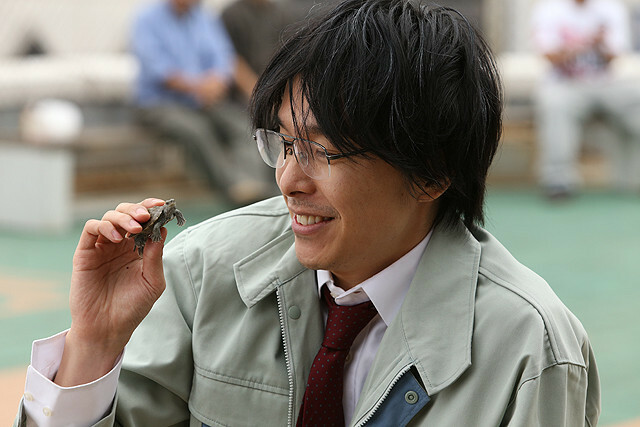 With his new companion, Ryoichi begins to come alive, but the day he brings Pikadon to work, his colleagues torment the baby turtle and in order to keep him safe, Ryoichi flushes him down the toilet. This is when things get weird. The first act feels like a Japanese version of Punch Drunk Love, wielding abrasive characters in hostile working conditions. It’s a workplace comedy about a man on the verge of a nervous breakdown. The sound design is a study in discomfort and the score doesn’t behave according to any of the rules audiences normally come to expect. I won’t lie, the first 30 minutes or so, feels like a chore. It’s hard to sympathize for Ryoichi and many of the scenes are played at an almost unbearable high volume, with the supporting cast shouting their dialogue. 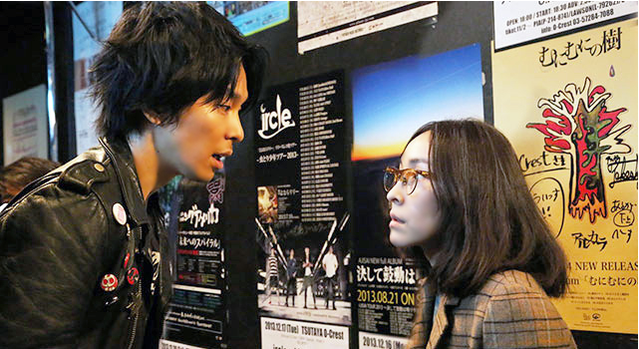 Ryoichi cowards away from society; he cries, he moans, he cries some more – and although actor Hiroki Hasegawa is a master of slapstick, the script gives Ryoichi very little depth in that first act. In fact, the only character you’ll come to like is the actual turtle. But those who stick around to the very end are in for a real treat. The turtle makes its way down the toilet bowl through the underground sewers of Tokyo eventually reaching an underground cave where he meets some unexpected guests. Borrowing a concept from The Christmas Toy, Ryoichi’s tiny friend finds its way to an orphanage of sorts – a home for lost pets and discarded toys, overlooked by a drunk caretaker. In addition to taking care of the pets and junkyard playthings, he’s salvaged over the years, the mysterious old man also provides each new resident with a magic potion giving it the ability to speak. 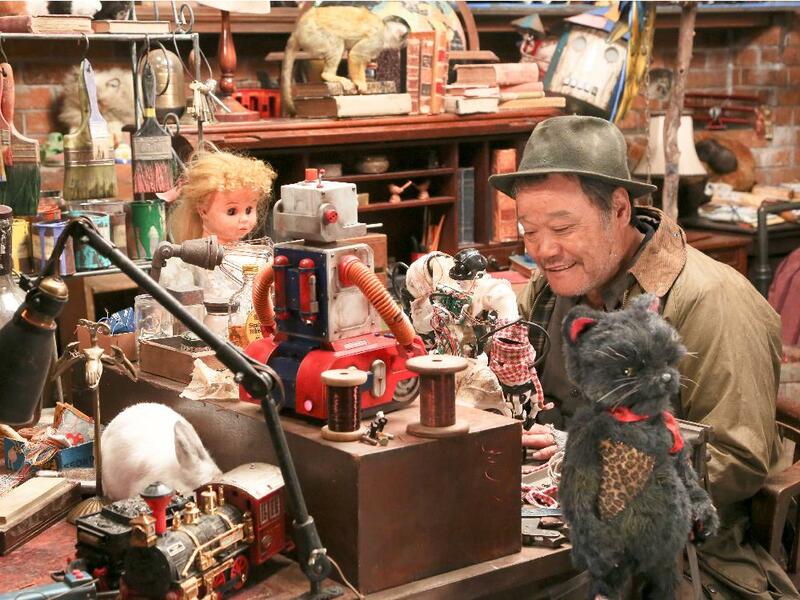 Yes, this is a Sion Sono film in which toys come to life and dogs and cats can talk, but as absurd as the premise might seem, Love & Peace works for one simple reason: it never takes its tongue out of its cheek. Although its stop-motion animation and puppetry aren’t convincing, Sion Sono doesn’t care; in fact, he goes out of his way at times to show the actual strings pulling the puppets. When Pikadon arrives, the man mistakenly gives the turtle the wrong magic potion. Instead of acquiring the ability to speak, Pikadon is awarded the ability to make Ryoichi’s dreams come true, and slowly Ryoichi goes from being a nobody to a worldwide celebrity. Only there’s a side effect: With each wish granted, Pikadon grows dramatically in size, an apt metaphor for Ryoichi’s ego which grows equally bigger as his career advances. As Ryoichi’s rags to riches story above ground begins to merge with the magical world of the underground, the film begins to truly come together. The third act is best described as a cross between Fish Story and Godzilla. There are some truly outrageous moments in Love & Peace – This is a one-of-a-kind experience all the way through, and the ballad of destruction in the final act reveals itself as one of the most exciting, amusing and touching of them all. 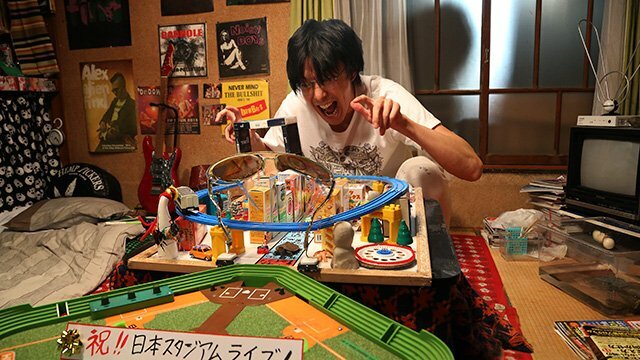 The juxtaposing between the giant reptile rampaging through Tokyo and his earlier scenes playing board games with Ryoichi is ingenious. Sono may not have created the most convincing-looking monster in cinema history, but he managed to give his movie monster a social relevance. There are clearly strong messages to found here, and a critical, but loving eye towards contemporary Japanese society – but overall, Love & Peace is a magical fairytale set above and below the streets of Edo. It takes a lot of imagination and talent as a filmmaker to follow this premise through until to the end. By mixing genres and eclectic styles with a lively tone and an intricately plotted multi-strand story, Love & Peace holds our attention blending humour, drama, romance and a truly awesome soundtrack (written and composed by Sono himself). But more importantly, Pikadon might just be the most charming monster ever to star on the big screen. When the Godzilla-like beast makes his way to the Tokyo Dome to reunite with his owner (a David Bowiesque Ryoichi, decked out in Ziggy Stardust attire), you’ll understand why Love & Peace is one of the most original movies in years. Sono put his heart and soul into this film, and it shows. Just when you think the story can’t possibly get any weirder, it does. When the old man’s secrets and motives behind his tinkering become clear in the film’s final reel, you’ll find yourself smiling. Love & Peace is hugely ambitious and oddly good-natured. Children will enjoy this new take on the irresistible idea of toys coming to life; adults will appreciate the witty script and everyone will marvel at the sights and sounds of Pikadon. As off-putting and quirky as it sounds, it’s held together with great confidence and a ton of energy. 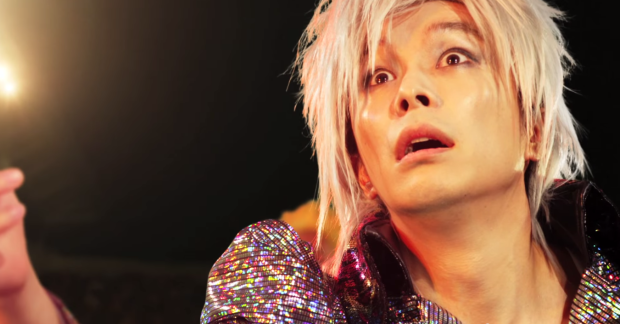 Sion Sono takes the risk of getting lost in his style of exercise but pulls it off. The result is a wonderfully entertaining and affecting patchwork of ideas, incidents, influences and genres. A must see! Some people take my heart, others take my shoes, and some take me home. I write, I blog, I podcast, I edit, and I design websites. Founder and Editor-in-Chief of Goomba Stomp and the NXpress Nintendo Podcast. Former Editor-In-Chief of Sound On Sight, and host of several podcasts including the Game of Thrones and Walking Dead podcasts, as well as the Sound On Sight and Sordid Cinema shows. Could This Nintendo Switch Leak be the Zelda Anthology? Nintendo Weekly Roundup: April Fools! What’s Wrong with the Nintendo Switch’s User Interface and Experience? Goomba Stomp is the joint effort of a team of like-minded writers from across the globe. We provide smart readers with sharp, entertaining writing on a wide range of topics in pop culture, offering an escape from the usual hype and gossip. @2019 - www.goombastomp.com. All Rights Reserved.